Consistent project methodology provides structure for high quality deliverables. Huffman Engineering, Inc.’s project methodology of careful planning before, consistent monitoring during, and quality check-up after projects assures both high value and high quality for customers. 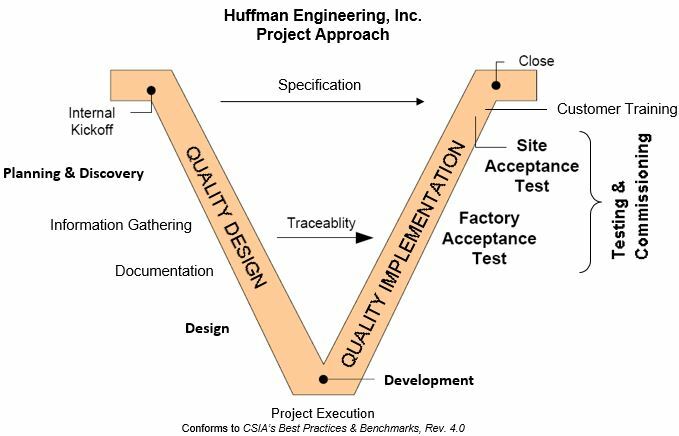 Using careful business analysis to determine and meet scope expectations, Huffman Engineering’s methodology requires defining the project up front. This minimizes misunderstandings and gives the customer the best value possible. By putting an emphasis on communication and information gathering, the Huffman Engineering team understands the customer’s needs and expectations before the project even begins. We recommend working with all the different groups and individuals who will be impacted by the resulting project. Our philosophy involves understanding the customer’s business and process model and incorporating that understanding into the project. Once we determine project needs and goals, the Huffman Engineering team creates specific documents that will be used throughout the project. These may include: User Requirements Specifications (URS), Functional Specifications Documents, or Sequence of Operations. The more preparation that is done beforehand, the fewer changes will be necessary during and after the project. Once the Functional Specifications are developed for the project, the Huffman Engineering team begins design and development. Careful documentation, including drawings, meeting minutes, customer communications and parts specifications, is part of this phase. Every attempt is made to keep the customer in the loop. Changes, suggestions, schedules, and progress reviews are important in maintaining the partnership we develop with the customer. While many people might jump right into the implementation phase of the project, Huffman Engineering has the distinct advantage of having carefully planned out our strategy and design. The work done beforehand provides the basis for quality evaluation and speed in the implementation phase of the project. As the project nears completion, testing and commissioning become very important. The project’s factory acceptance test (FAT) allows customers to visit the Huffman Engineering shop and see the project as it is supposed to work. Every control panel goes through a careful check-out procedure. After that check-out, the control system can be checked by simulation before the project hardware is shipped to the customer site. This step minimizes start-up time and eliminates the need to make a lot of changes on site. On-site installation and integration run smoothly due to the ongoing testing and careful communication used during the implementation phase. Customers find the early preparation, testing procedures, and communication all work together to provide outstanding value to them at this point. Early preparation during the project helps eliminate costly mistakes and time consuming on-site work during start-up. The professional approach that Huffman Engineering takes toward project development and implementation assures the customer that they will get a system that meets the needs outlined at the beginning of the project. Once installed, Huffman Engineering certifies each system and agrees to support and service that system. Reputation, reliability, and quality are all highly valued at Huffman Engineering, Inc.